A U.S. aircraft carrier strike group will arrive in the Middle East within days, U.S. defense officials said, ending the longest period in two decades that such a military presence has been absent from the region. John C. Stennis, which is currently sailing toward the Persian Gulf. 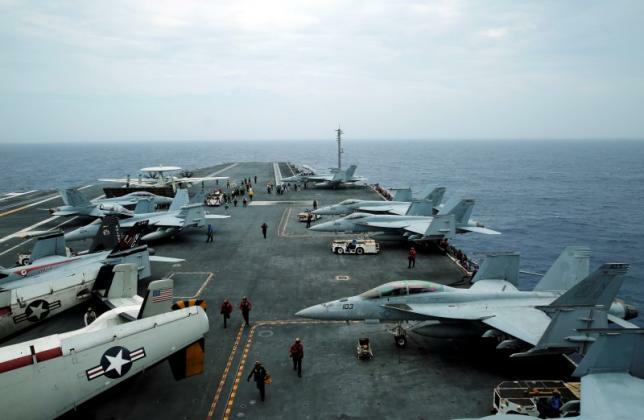 The USS John C. Stennis and accompanying ships will arrive by this week’s end, the first such military presence in the region in eight months, the officials said, to exhibit a show of force against Iran. Tensions between Washington and Tehran are growing over renewed Trump administration sanctions on the country, Iranian-backed groups in Syria, Iraq, Lebanon and Yemen and Iran’s latest ballistic missile tests. The naval deployment also will support the continuing war against remnants of Islamic State in Iraq and Syria, and the U.S. war in Afghanistan, where the U.S. and Afghan militaries have ramped up airstrikes in an effort to press the Taliban into peace talks and rid the country of what they consider irreconcilable fighters, the officials said. The Stennis is scheduled to remain in the region for about two months, the officials said, spending most of that time in the Persian Gulf. Its presence “certainly provides a deterrence” against any potentially hostile Iranian activity in the region’s waters, one of the officials said. Iranian officials didn’t immediately respond to a request for comment, though in the past have denounced U.S. naval operations in the area as provocations. U.S. aircraft carriers have long maintained a continuous presence in the Persian Gulf region, carrying thousands of personnel and dozens of planes, missiles and other firepower. In recent years, the U.S. military has occasionally deployed two carrier strike groups in the region. But until now, there has not been a U.S. aircraft carrier strike group in the Persian Gulf since the USS Theodore Roosevelt left for the Pacific in March. The absence of a carrier strike group this year was part of a realignment of capabilities away from the Middle East and toward China and Russia, Pentagon officials have said, in keeping with new U.S. strategic goals. But that emphasis at times has appeared out of step with the White House which repeatedly has called Iran a top national security threat. The Pentagon also pulled four Patriot missile-defense systems out of Jordan, Kuwait and Bahrain in October. The arrival of the Stennis “provides a lot of great flexibility,” one defense official said. The Stennis currently is moving through the Indian Ocean. It has been at sea since mid-October and most recently conducted a port visit in Singapore late last month. On Monday, the Trump administration urged Europe to impose new sanctions on Iran after it test fired a medium-range ballistic missile considered capable of carrying nuclear warheads that could reach parts of the European continent. Iranian officials responded that the country’s missile program was defensive in nature. Mr. Pompeo traveled to Brussels on Monday, where he is scheduled to meet Tuesday with foreign ministers from North Atlantic Treaty Organization member nations.